The Panagiotis (Greek: Παναγιώτης) is a shipwreck lying in the white sands of an exposed cove on the coast of Zakynthos, which is among the southernmost of the Ionian Islands of Greece. 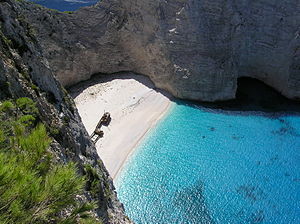 Navagio ("Shipwreck"), the spot where she lies, is a tourist attraction on the north-western side of the island, with thousands of visitors each year. She was built in Scotland in 1937 as Saint Bedan and wrecked in 1980. It has been claimed that the ship was carrying contraband cigarettes and being chased by the Greek Navy. The coaster Panagiotis was built in 1937 at Bowling on the River Clyde as Yard 341 by Scott & Sons, and fitted with a 532 bhp diesel engine made by British Auxiliaries Ltd. When built, she measured 157 feet in length and 26 feet in width. She had a draft of 14 feet, and a gross register tonnage of 452. The Panagiotis changed hands and names since her construction. 1937 - Originally named the MV Saint Bedan, she was launched on Thursday, 14 January 1937 for J. & A. Gardner and Co. Ltd. of Glasgow. 1964 - She was sold to Greek owners, M. Gigilinis and S. Kakassinas of Thessaloniki and renamed Meropi. 1966 - She was sold to N. S. Kalfas and renamed Charis. 1975 - She was sold to P. Lisikatos & Company of Piraeus and renamed Panagiotis. 1980 - She ran aground on 1 October, on the island of Zakynthos, and was abandoned. The most commonly accepted story[who?] regarding the wreck of the Panagiotis maintains that she spent the later part of her life as a smuggling ship. In 1980 (during a time of record population lows on the island of Zakynthos), Panagiotis was making its way from Turkey with a freight of contraband cigarettes (for the Italian Mafia, as some versions of the story assert). The crew was suspected by authorities, and so the Panagiotis was pursued by the Greek Navy. Encountering stormy weather, the ship ran aground in a shallow cove on the west coast of Zakynthos, to the north of Porto Vromi, where the crew abandoned her to evade the pursuing Navy. The wreck remains at the site which is now called "Navagio", Greek for "shipwreck." ^ a b c d e f g h i j k l m n o p q r s t u v w x y z aa ab "Motor Vessel Saint Bedan". Clyde-built Ship Database. 2017. Retrieved 6 August 2017. ^ a b "MV Saint Bedan". Clyde-Built Database. Archived from the original on 3 March 2016. Retrieved 6 August 2017. ^ zakynthosinformerblog. "Captain Charalambos Kompothekras – Kotsoros – The Zakynthos Informer Blog". Retrieved 2018-12-25. ^ Dilouambaka, Ethel. "How Did The World's Most Famous Shipwreck Come To Be?". Culture Trip. Retrieved 2018-12-25. This page was last edited on 25 December 2018, at 16:54 (UTC).